This isn’t hot off the press (a 2012 review article by Tosh & McDonald) but it’s probably more important now than when first published, given our rapid advances in understanding of the importance of the microbiome in human health over the last year or two. A happy, healthy human microbiome is characterized by diversity (both in terms of number of different species, and diversity within the species), and composed mainly of bacteria that we’re not familiar with – Fermicutes and Bacteroidetes). Antibiotics have a profound and sustained effect on the human microbiome (even those that are typically associated with no or few side effects). This results in a reduction in both diversity and change in composition, which is bad news for human health. In particular, this leave the gut more open to colonization with unwanted intruders aka antibiotic resistant bacteria. (1) Developing and using more microbiome-sparing antimicrobial therapy. The idea of ‘selective digestive decontamination’ flies in the face of this objective. (2) Developing techniques to maintain and restore indigenous microbiota. A lot of progress has been made here, for example, in the case of faecal microbiota transplantation (FMT) for the treatment of recurrent CDI. (3) Discovering and exploiting host protective mechanisms normally afforded by an intact microbiome. Rather than obliterate our microbiome with overuse of antibiotic “Atomic bombs”, we need to carefully tend individual and collective microbiomes in order to make them resistant to the increasing queue of antibiotic resistant colonizers! Article citation: Tosh PK, McDonald LC. Infection control in the multidrug-resistant era: tending the human microbiome. Clin Infect Dis 2012;54:707-713. Image credit: Modified from ‘Mushroom cloud‘. The question for us as infection preventionists is – how can we sustain exposure to the good guys whilst protecting against the harmful ones? It seems common sense- All these multidrug resistance like C.Diffi or Vancomycin resistant enterococci(VRE) or methicillin resistant staph(MRSA) or carbepenem resistant enterococci(CRE) are not seen in pediatricians office or in schools or in kindergarden nursery- why? its not becos other bugs are more powerful- it is simply a numbers game. Schools and kindergarden nursery are a petri dish of bugs where the above mentioned bugs coming in small numbers stand no chance. I could not find one for VRE or CRE but if we indulge in reckless antibiotic therapy we would see these bugs in the community too. 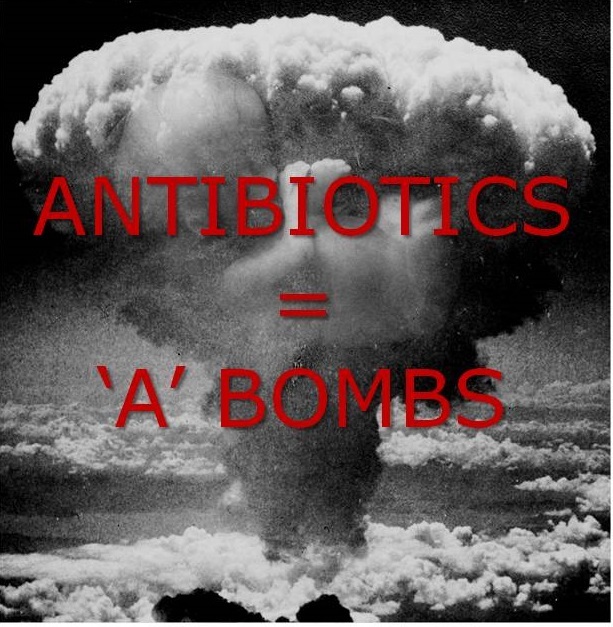 Which brings me to an important question- Why is an antibiotic therapy 3 or 5 or 7 days for simple infections? I figure this is to achieve complete kills- but can we just do one dose and let the body work it out? In surgery we give only one dose of intravenous antibiotics so why not one dose in all situations- Who completes an entire course of 3 or 5 or 7 days for simple infections? Murlikrishna sorry for the delayed response. I think the question is why do we give a single dose of antibiotics for surgical prophylaxis? Yes, this reduces the risk of SSI, but surely it also promotes antibiotic resistance?